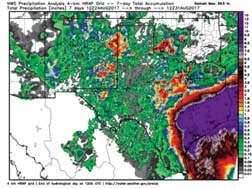 Rainfall amounts between 20 and 50 inches producing catastrophic flooding were the rule in that purple shaded area in Southeast Texas. 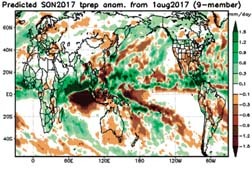 The important thing to remember in all of this...we are just entering the peak of the tropical cyclone season. It is possible that other storms could impact the Gulf Coast...be prepared. 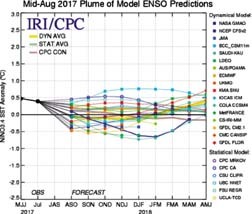 The chart above shows all the various models and whether or not they think El Niño or La Niña will happen in the next several months. The yellow line is the forecast mean of all the models and suggests a “neutral” ENSO pattern. There is a tendency for the ENSO regions to be slightly cooler than neutral, but likely not evolving into a full blown La Niña. 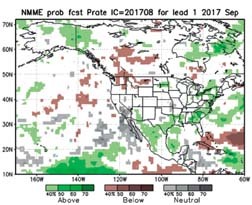 That being said, if the Pacific continues to cool, a short lived and weak La Niña event may occur. Pretty crazy how things have changed during the last few months. Watching closely! Interesting that the NMME Model is the only model of the three that keeps Southeast Texas wetter than average. I think it is latching onto the fact that the tropical season is far from over. Does that mean it is right? No. But given the recent pattern, one certainly has to take it seriously. The one strike against it is that when we get multiple storms moving over the same body of water, it stirs the water up enough to cool it down. Less heat in the ocean, less development of future tropical cyclones. The JAMSTEC and the CFSv2 both advertise a drier pattern for the Gulf Coast, which would be fantastic. Are they correct? Again, tough to say...but aside from any FUTURE tropical cyclone impact, I would say a drier than average fall is a better bet for the wider area. At least that is the way I am leaning. Drought? Not necessarily. 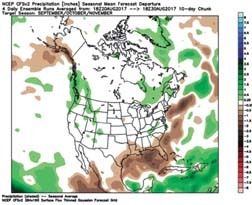 But drier and something to watch closely.